Leaving behind the historic city of Kyoto, we took a train north into the Japanese Alps. From Kyoto to Nagoya we got to experience our first bullet train, which was not a disappointment. We switched by to a normal train for the longer journey up into the mountains. 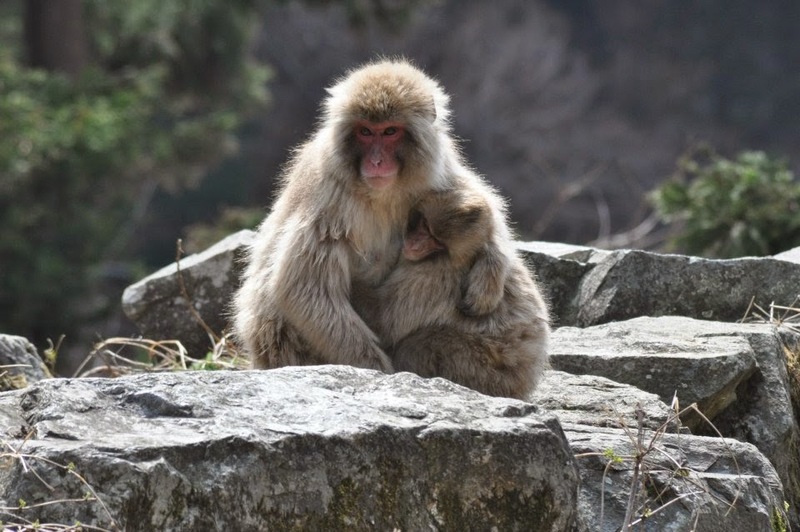 Our arrival into Matsumoto saw a dramatic change in temperature and we were very grateful we had lugged around our winter gear. We stayed at the very recommended Matsumoto Inn, which was right beside the train station. Not wanting to waste our precious time, we dropped our luggage and headed out to the main attraction of the town: Matsumoto Castle. 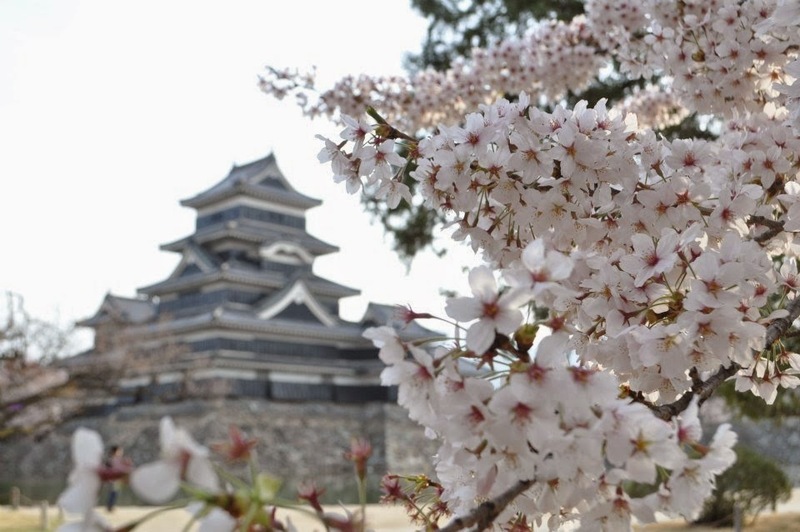 This castle is special in that it is one of only 12 remaining original castles from the feudal age in Japan. It is very reminiscent of Age of Empires. Our timing was also perfect, without realising we caught the closing ceremony of the blossom festival. Unlike the lowlands the blossoms were in peak bloom and flowers and petals were everywhere. Within the castle grounds there was live museum playing and it seemed like the majority of the town out in order to have lunch have a picnic under the blossoms. Considering the freezing temperatures I thought this was a bit mad, but I am sure the sake bottles helped with this issue. The sun set as we were exploring the grounds and only added to the beauty of the castle. Would definitely recommend coming here. Afterwards we found a lovely local restaurant on a restaurant street (the only one we encountered). The next day, we headed off earlyish for out day trip to the mountains behind Nagano. 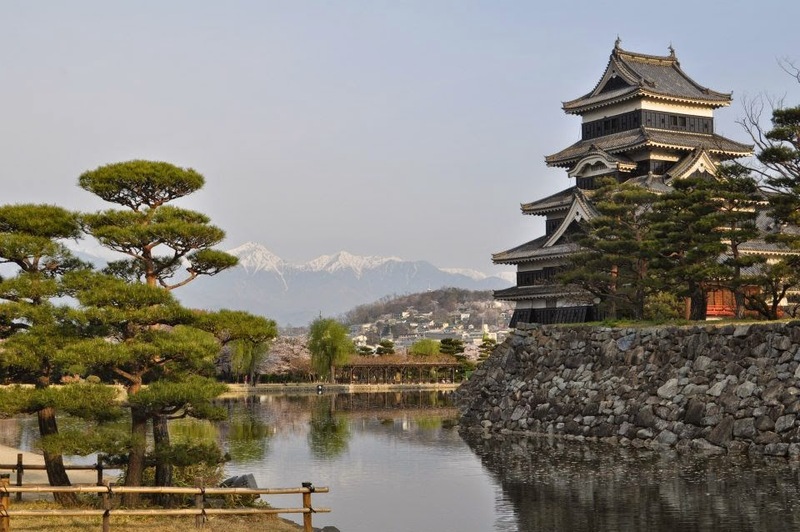 Just an hour train from Matsumoto is the city famous for hosting the winter Olympics. We got our timing a little wrong and had to wait a little in town, before hoping on the train up to the Monkey Park. From the train station, you need to take a bus up further into the hills (although only a 15 min ride would be at least 2 hours walk uphill). From the bus stop the park is a further 30 minute walk but completely worth it. As it was spring there was no significant snow around, but it did mean that it was baby season. 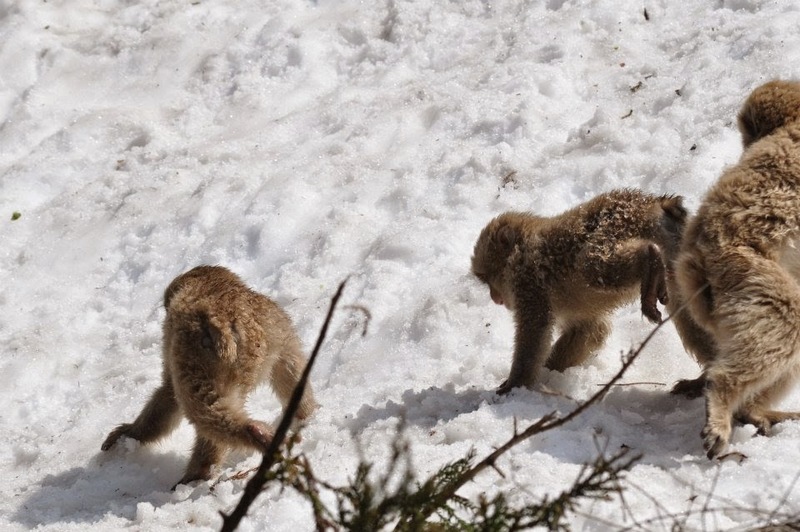 As we arrived into the park we were greeted by tens of baby monkeys running around playing in the remaining snow. Their parents were more interested in eating and basking in the sun rays. We spent a good deal of time here just watching their interactions and enjoying the cuteness. We even got to see one go for a dip in their famous hot springs (although the one we saw was artistically made – there are others scattered elsewhere in the park that are more natural – but a decent hike away). Eventually we headed back down and to Matsumoto. The train ride is actually worth the trip in itself. The views from the train are as remote as is really possible in congested Japan. The contrasts between NZ and Japan were at their most here. It was very unnerving to have a complete lack of any animal. There were no farm animals, rabbits, or expected wildlife that you would normally see in the countryside. Agriculture was the biggest presence in between the villages. Back in Matsumoto we explored the downtown area which was mainly focused on satisfying the Japanese materialistic culture. There are stores for absolutely everything and yet we had trouble finding some of the simple things we were looking for amongst the chaos of their stores. We headed off the next day to Kyoto; the historical centre of Japan. After arriving we dropped off our bags and headed off to explore. The recommended way is either on foot if you have the time and stamina or to buy a day bus pass (the buses go everywhere). Our first stop was the largest freestanding wooden structure in the world Higashi-Honganji Temple. Absolutely massive inside and beautifully decorated. The nature of this temple meant that it was also a very nice relief from the surprisingly warm temperatures. Afterwards we headed off on a long walk to the Imperial Gardens to book our tour at the Emperors Palace. The walk up was nice and in the gardens we found our first serious blooms. As we later learned there are two types of blooms in Japan, single and double petal. In Kyoto, we had missed the single but were lucky enough to catch the double, which were massive pink flowers (peaches apparently). 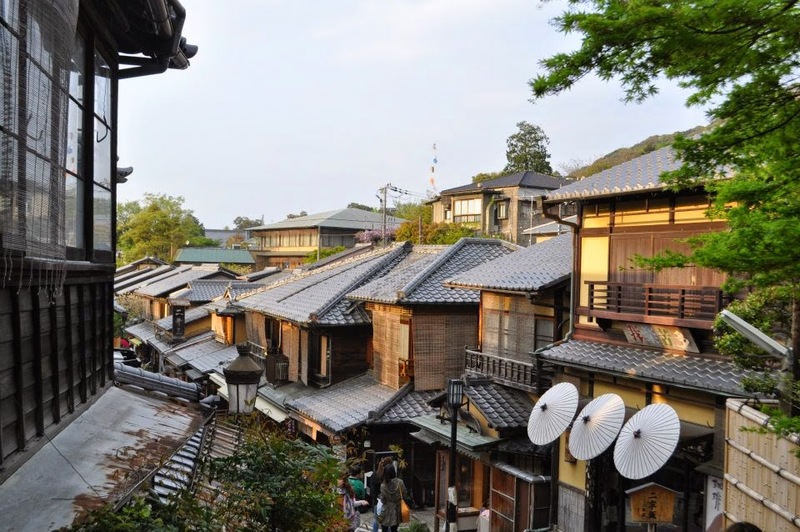 As Kyoto is very expensive for accommodation, we actually stayed just outside of the city in a small town (although there was no definitive border between the two…everything merges due to the high population) of Otsu on the foreshore of Lake Biwa. We checked in and headed to the lake front and found a pretty disgusting noodle bar. Which was unfortunate, as afterwards on our way back we explored the mostly closed shopping street and wandered down this long passageway to what turned out to be the best food we had in Japan. This restaurant we have no idea of the name or what we ate as the waiter/chef/owner didn’t speak a word of English. It was absolutely fantastic with him just preparing dishes and serving them. We were absolutely bloated upon leaving. Martin also commented that this was where he had the best sake. Our next day in Kyoto was temple bashing and the palace tour. 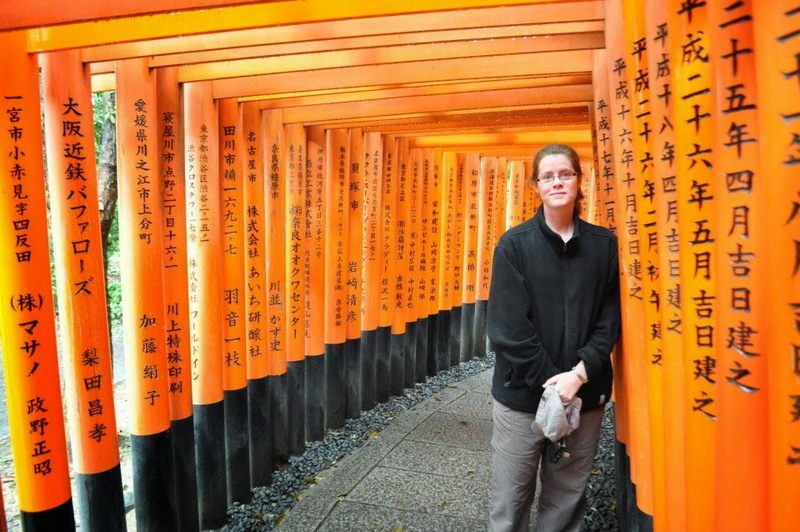 We started off at the very famous Fushimi Inari Shrine. I had long wanted to go to this shrine, as for me it was one of the first things that came to mind when thinking of Japan. Beautiful vermillion pillars with important words engraved on them to walk through for miles.We headed back to town to explore the main shopping area hoping it would be similar to Osaka in the respect of food, but sadly we were let down with not too much exciting foods catching our attention or tantalising our taste buds. After lunch we headed off for our tour of the Imperial Palace. The complex as it stands today is still massive, and it was hard to believe that the remaining buildings only represented a 1/3 of the original. One fun fact, was that the palace has been rebuilt roughly every 100 years due to the constant threat of fire. 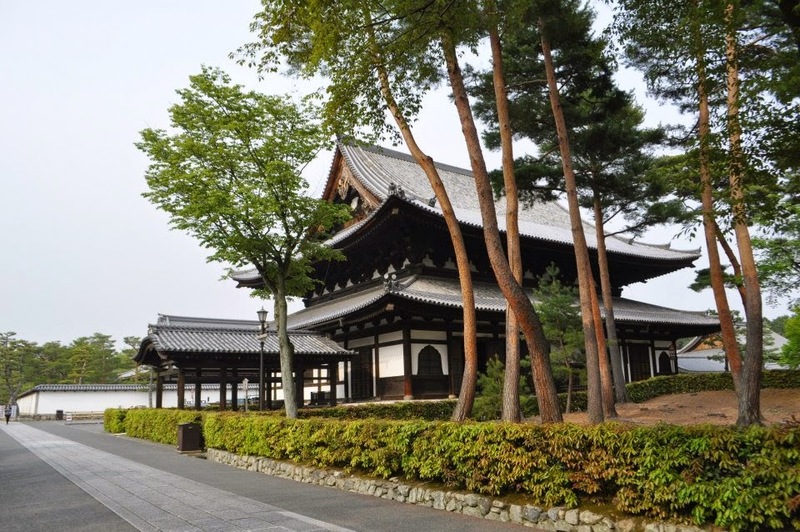 This is very important as every building is made from wood, and the roofs are thatched with Japanese cedar. The gardens inside the palace are of the landscape style but were isolated to just a few areas which felt out of place, which I imagine was due to the fact that there would have been many more buildings previously. Once the tour was over (1.5 hrs long) we bussed and walked up to Kiyomizu Temple. 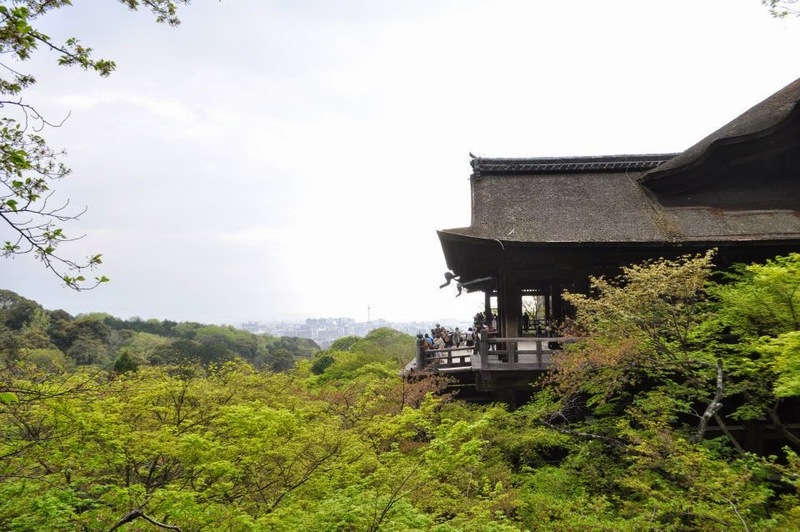 This temple is high up on the hills surrounding Kyoto and provides a good view over the area. The wooden pillars the complex sit on were extremely massive and hard to believe that once upon a time such trees lived in Japan. Didn’t see anything close during the rest of our stay for size. A highlight of this temple is the water blessing. The temple is famous for its pure water which you are supposed to wash your hands in and drink if you wanted. It was icy cold to touch but due to the collection mechanisms being shared (although they did UV for 2 secs in between each person, I decided against the drinking aspect). Beside the temple is the only remaining old town. Japanese are very much into the newer is better concept so old buildings of the traditional styles you see on the movies are very hard to find. The narrow cobbled streets and buildings here were beautiful, and as you exit this are you come across the main area to find some of the remaining 200 Geisha’s in Kyoto. We were very lucky and actually saw a bundle running between stairs at a training house, and saw 5 in total on their way to clients later on. The next day we had another quick wander at the water front of Otsu, which was a bit clearer this time. Smog is everywhere in Asia it seems so its quite sad that you don’t really get to see everything that you should. Before leaving Kyoto we went to one more temple Toji. It wasn’t like the other temples we had been to in that it was based on Chinese design, and had the largest pagoda in Japan. Our last stop was the only official Japanese garden we visited during our time; Shosei-en Gardens. This was also the only place that we saw a different kind of bird other than sparrow, crow, or myna throughout Japan. The gardens were very lovely and immaculate. It is such a different mind-set in Japan, as rather than planting the plants and letting them grow, they modify their growth which does make for pleasurable viewing but still felt a bit weird from a Kiwi perspective.